The Other Half begins with a man walking beside railroad tracks, music in the background. He calls someone and says he will be home soon and he wonders where they are. He ends the call and places earbuds back in his ears, the music increasing in volume. You don’t realize it then, but that was the last perfect, blissfully unaware moment for Nickie (Tom Cullen). Fast-forward five years and Nickie has moved away from home to Canada where he is restless, depressed, and angry. This is all due to the disappearance of his younger brother. He is a loose cannon. He dates or perhaps just sleeps around, nothing serious. In a dance club, he spots a girl who dances without any care. This same girl appears in the restaurant where he works, and she is drawn to him. Her name is Emily (Tatiana Maslany), and the two very easily form an attachment to each other. However, it is apparent to Emily that Nickie is damaged goods, but she does not know why. Eventually, Nickie learns that Emily has her own troubles. She is a rapid cycling bipolar. This is not a film with special effects and bells and whistles. It simply is a film about two damaged people trying to make their relationship work, for better or worse. This is a study on love, regrets, and two people who each have their own issues to work out. The title of the film is a huge giveaway to how the relationship between Nickie and Emily really is. 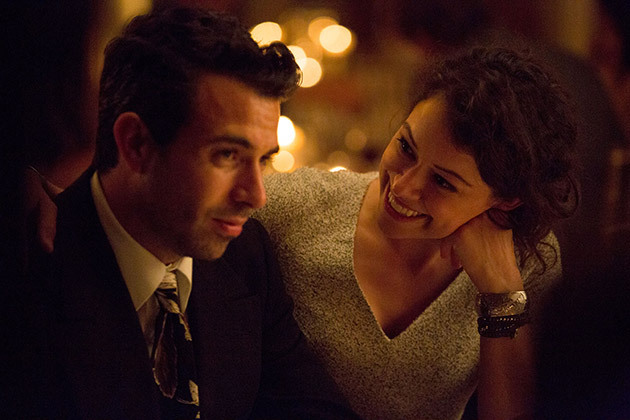 As this is a study on a relationship, it relies heavily on the acting chops of Tatiana Maslany and Tom Cullen. Cullen is just given this massive anger to always have on the edge of his sanity. The way he is shot, he always seems like a much larger guy, muscular in 50’s t-shirts and button-ups. In reality, Cullen is pretty skinny and lanky, so I wonder how much muscle he put on for this role. It goes well with his emotional resumé as Nickie. On the other hand, Maslany must play her character in three different ways, normal, high on emotion (manic), and depressed. It is one thing to just play a depressed character, but have to seemingly switch so easily from one to the other is impressive. If you have seen Maslany’s Orphan Black, you know she is able to play so many characters that all look the same. The impressive Maslany takes Emily under her wing and she does such great things with her. Because this is an indie film that is centered on a relationship, the cast is small (and frankly, this film did not need a large cast). Henry Czerny (Revenge) plays Emily’s father and Suzanne Clément (Mommy) plays her stepmother. This is couples who have been through the gauntlet with Emily, and have not taken well to her new relationship. They are dismissive of the reality of the relationship, hoping Nickie will leave and not take advantage of her. The only other two main cast members are Sammy (Mark Rendall), Nickie’s cousin and friend, and Emily’s friend, Anna (Deragh Campbell). They both add to the normalcy of Nickie and Emily’s lives. To see The Other Half and properly be impressed by it, you must be aware that it is all about Nickie and Emily’s struggle and commitment to each other. It is saturated with immense acting talent and the gumption of director/writer Joey Klein to keep it simple but enthralling at the same time. I had a problem with the ending. It is one of those non-endings which I tend to loathe. However, given the chance to speak with Klein, I agreed with his perspective that this is a film that will not have the characters and story wrapped up in a pretty bow (this is one of the perks of attending SXSW, you get to ask questions of the filmmakers). There is possibility and failure hanging in the air at the end for Emily and Nickie.